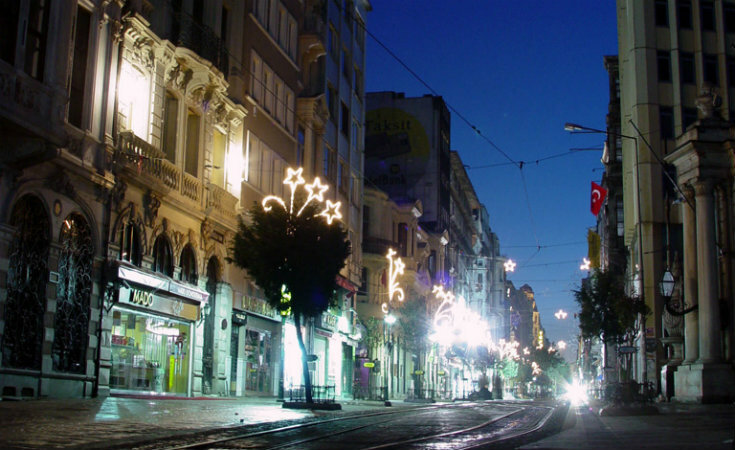 For most who want to discover Istanbul the first stop is normally Beyoğlu. Known until the last century as Pera, which means “the other side,” it is today accepted as the artistic and cultural center of Istanbul. For the most who want to discover Istanbul, the first stop is often Beyoğlu. Known until the last century as Pera, which means “the other side,” today it is accepted as the artistic and cultural heart of Istanbul. Here you find a list of things to do in a district alive at all hours of the day and night. If you are interested in shopping, visit the Atlas Pasajı; the Avrupa Pasajı, famous for its gift shops; and the Aznavur Pasajı, known for its Italian architecture. Walk around Asmalımescit in the evening and dine in one of the many restaurants located in historical buildings. Board the world’s second oldest underground public transportation system (the finiküler) in Tünel and travel down to Karaköy. Walk around the historical Balık Pazarı (English: Fish Market) and eat a fish dinner in the Çiçek Pasajı. Visit the Galatasaray Hamam with its classical Ottoman architecture. Go to the one of the restaurants/cafe around Galatasaray with a terrace and watch the Bosphorus. Take a break in the Hazzo Pulo Pasasjı built by the merchant Hacopulo in 1871 and drink a tea in its courtyard. Visit Saint Antoine, Istanbul’s largest Catholic church. Visit one of the important art galleries such as the Yapı Kredi Kazım Taşkent Art Gallery, Akbank Sanat, Galeri Nev and Galeris. If you like nightlife, check out a venue hosting live music. Try the chocolate in Meşhur Beyoğlu. If you are interested in second-hand books visit the Aslıhan Pasajı, check out the book stores and browse the used books, old journals and displays. Stop by the Pera Museum, a modern art and cultural center. Watch a film in the Atlas Cinema, one of the important, historical cinemas in Istanbul.